Gliding is often confused with hang-gliding or other forms of flying. We fly sailplanes. 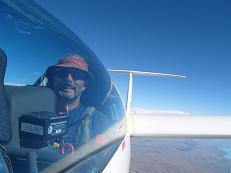 The difference is that a sailplane is a complete aircraft with rigid wings, wheels and an enclosed cockpit. We call our sport gliding or soaring because "sailplaneing" is too much of a mouthful. It's a sport because it's lots of fun and always challenging. Soaring is the art and science of using energy available in the atmosphere to stay airborne without an engine and travel cross-country distances. To get airborne, the glider is towed by another plane, called a tug. The glider pilot can release the tow rope at any time or call the tug pilot on the radio to tell him where to go. Usually we tow up to about two thousand feet. Don't worry if this sounds like a long way up - the higher you are, the safer it is. After releasing the tow rope, we can find a thermal and use that rising column of air to ascend into the sky. 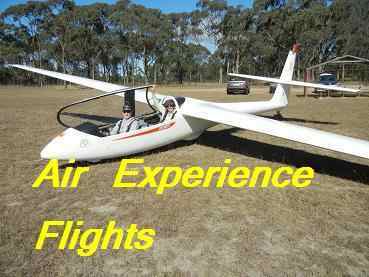 If it's your first flight, you'll be sitting in the front seat of a two-seat glider piloted by one of our instructors, who sits in the back seat.